Los Angeles’ own Datta Boy had quite the journey. He found his passion for music at the tender age of 11 and kept going all the way to High School. That is when he decided to put music on hold to focus on football at The University of Nevada Reno, where he ran with the Wolf-pack as a Fullback and later, transferred and graduated from Southern Utah University where he was a Hybrid Blocker for the T-Birds. After playing pro fro a year, Datta slowly but surely returned to his first love: music. His unique style and obvious versatility is inspired by the likes of Ludacris, Redman, Method Man, Busta Rhymes, Jadakiss, J.Cole, Kendrick Lamar, and Big Sean. His brand new video “Threat” is directed by Ralph Mariano. BC : How did you get started? Datta Boy : I started rapping at the age of 11 the same day Lil Bow Wow first album “Beware of the Dog”came out. I thought you had to be an adult to rap but Shad Moss proved me wrong. I always looked up to Ludacris and Jadakiss and Busta Rhymes when I first started rapping. BC : How did your new song “Threat” and the video concept come about? Datta Boy : Well, the idea came from watching “Purge Election Year”. There was character called the Candy Girl played by Brittany Mirabile and she had her friend alongside her. The concept of the video is to seek revenge on who killed the sister, even though it was never mention in the movie that she had a brother. I wanted to show my vision. So I came up with this idea that why not seek revenge on the one who took her out during the purge. Also in the video I bring four friends with me. The name of the characters are Swan, Slugger, Lady Liberty and Hammer, who all agreed to go on this rampage in the city. 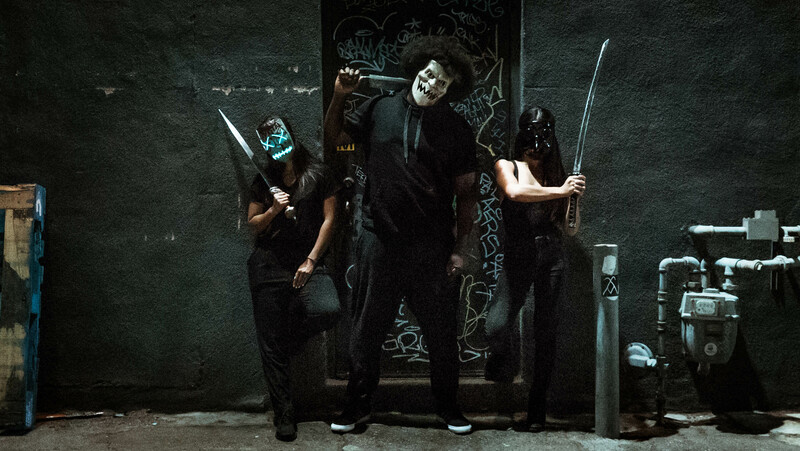 I hope Universal sees it and maybe wants to use the song or put us in one of the upcoming purge movies. BC : Are you working on a full project? What can we expect from you moving forward? Datta Boy : Yes I am in the process of my up and coming project called “The Duke Ellington Project” with R&B Singer Ally-B and Producer and Vocalist Ronny Bueller. Also 2 songs are produced by Ronny Bueller. You can expect a lot more music videos most likely directed by RLM Films. My motto is “If I cant make a video for it then no point in doing it”. Also I will be doing shows as well, I have the right type of music and I’m ready to do so!